Precious metals futures posted January gains ranging from 3% for platinum to 8.6% for palladium. Gold and silver each rose 3.4%. Most precious metals gained Thursday, the final trading day in January. Gold ended at a more than nine-month high and scored its fourth straight monthly increase. Gold for April delivery advanced $9.70, or 0.7%, to settle at $1,325.20 an ounce on the Comex division of the New York Mercantile Exchange. The finish was the highest since April 24 when the yellow metal ended at $1,333 an ounce. 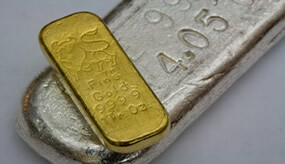 "The ongoing trend in precious metals markets continues. The much more dovish-than-expected Fed stance continues to support commodity prices across the board, weaken the dollar and support the precious metals complex as well," Reuters quoted David Meger, director of metals trading at High Ridge Futures. Gold futures rallied 3.4% in January. They have moved up a combined 10.8% through four consecutive months of gains. Silver for March delivery tacked on 14.5 cents, or 0.9%, to end at $16.072 an ounce. The settlement was the strongest since July 10 when silver settled at $16.087 an ounce. Silver futures also gained 3.4% in January. They have climbed a combined 13.1% in back-to-back monthly wins. April platinum added $8.50, or 1%, to $824.70 an ounce, for a 3% increase in January. Palladium for March declined $16.50, or 1.3%, to $1,299.90 an ounce, but jumped 8.6% on the month. On Jan. 17, the metal scored a record settlement at $1,348.20 an ounce. Gold added $12.55, or 1%, to $1,323.25 an ounce. Silver rose 16 cents, or 1%, to $16.075 an ounce. Platinum added $9, or 1.1%, to $821 an ounce. Palladium jumped $36, or 2.7%, to $1,380 an ounce. In LBMA results for January, gains reached 3.3% for gold, 3.9% for silver, 3.4% for platinum, and 9.3% for palladium. American Eagle gold coins reached 65,500 ounces, registering increases of 2,083% from the 3,000 ounces sold in December and 12% from the 58,500 ounces sold in January 2018. The monthly total was the highest since January 2017. American Eagle silver coins hit 4,017,500, marking gains of 719.9% from the 490,000 coins sold in December and 24.2% from the 3,235,000 coins sold in January of last year. The monthly total was also the highest since January 2017. American Buffalo gold coins reached 23,500, logging a 1,466.7% increase from the 1,500 coins sold in December while slipping 2.1% from the 24,000 coins sold in January 2018. American Platinum Eagles reached 27,100 coins. Last year’s edition launched Feb. 12, 2018 and garnered first-month sales of 20,000 coins. Below is a sales breakdown of U.S. Mint bullion products with columns listing the number of coins sold during varying periods.